Unforgettable characters, sizzling romance, and riveting suspense: These are the trademarks of beloved author Judith McNaught. 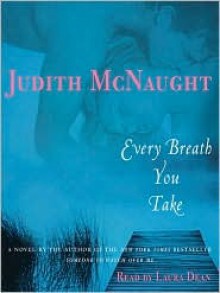 With millions of devoted fans and ten New York Times bestsellers to date, McNaught is a writer whose work just gets better with each new novel–and Every Breath You Take is the book readers have been waiting for. Returning to the lavish Chicago setting of her popular novel Paradise, and revisiting some of that book’s characters as well, this story will captivate in inimitable Judith McNaught style.High atop a snow-covered hill, the stately old Wyatt mansion is perched like a crown, its stone spires pointing upward, its stained glass windows glowing like colorful jewels. Such opulence means success and, surely, happiness. But on the eve of wealthy philanthropist Cecil Wyatt’s eightieth birthday, all the money in the world won’t bring back his missing grandson, William Wyatt. The only thing for certain: Foul play was involved.The family, the police, the media–all have tried in vain to discover the young man’s fate. Now suspicion has turned shockingly toward William’s own half-brother, the rather distant and enigmatic Mitchell Wyatt.Kate Donovan never dreamed that a chance romantic encounter on a tropical island paradise would tag her as a suspect in a high-society murder case. But after Kate tangles with the darkly charismatic Mitchell Wyatt, she finds herself cast in a shadow of guilt and mistrust. As the Chicago police tighten their net, it will take all of Kate’s ingenuity to clear her name. With her calm, cool wit, and the help of a man who may or may not be a dangerous catch, Kate vows to claim the life and love she desires.From the Hardcover edition. I'm a little shocked that this one isn't classified as a Second Opportunities book. It has cameo's from other characters. I'm really starting to fall in love with this author. Too good to put it down...!